I took up the matter of the Iranian president's possible role in the 1979-81 seizure of the U.S. embassy in Tehran at "Ahmadinejad - Hostage Taker?" This weblog entry adds new information to that and related topics in Mahmoud Ahmadinejad's biography. Nov. 13, 2006 update: GatewayPundit provides four pictures of what appears to be the young Ahmadinejad..
Nov. 14, 2006 update: Texas Rainmaker provides the full picture shown at "Ahmadinejad - Hostage Taker? in the upper left. Dec. 10, 2006 update: I have been contacted by Marisa of www.makingsenseofjihad.com who kindly directed me to her posting, "A Little Bit of Ahmadinejad in the Night," where she quotes an article from the February 14, 1999 issue of Aria, a no-longer-extant Tehran morning paper. In it, Ahmadinejad is positively identified as one of the five committee members who planned the takeover of the U.S. Embassy in Tehran in 1979. In addition, Michael Rubin points to the April 30, 2003 issue of Ya Lisarat al-Hussain, the mouthpiece of the hard line Ansar-i Hizbullah movement, which describes Ahmadinejad as a participant in the embassy seizure. July 1, 2009 update: John Rosenthal at NewMajority.com offers evidence that Ahmadinejad was one of the commandoes who carried out the gangland-style murder in Vienna on July 13, 1989, of three leaders of the Democratic Party of Iranian Kurdistan – Abdul Rahman Ghassemlou, Abdullah Ghaderi Azar, and Fadhil Rassoul. 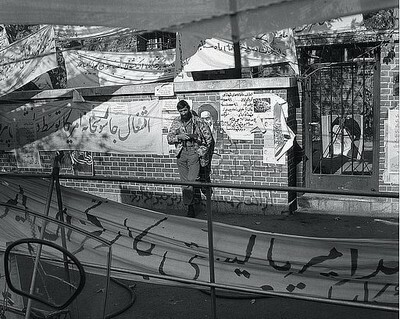 July 11, 2009 update: Karl-Hermann Görs writes me that he was in Tehran in 1980 and took the photograph below of two soldiers sitting on sandbags outside the occupied U.S. embassy. He writes that "Einer der beiden Männer hat eine derartige Ähnlichkeit mit dem heutigen Präsidenten des Iran, dass ich zu behaupten wage, er ist es" ("One of the two men has such a distinct resemblance to the current president of Iran, I bet it is he"). He also suggests that the distinctive look of the other soldier may help identify the Ahmadinejad-looking one. 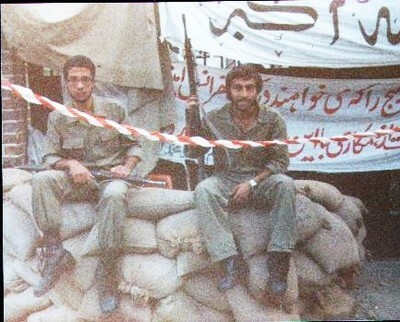 Is that Ahmadinejad on the right in this picture taken by a visitor to Tehran in 1980?